On 27 Nov 2013, Muhammad Bekjan, an imprisoned Uzbek journalist, was awarded the annual award of the Freedom of Press instituted by the Reporters Without Borders (RWB). The award has been issued since 1992, and one journalist and one news media outlet can be awarded it, if judges find they made a significant contribution to the protection and development of freedom of the press. The awarding ceremony is traditionally held in Paris, where the RWB has its main office, but this year ceremony was held in Strasburg as part of events the RWB organized during the Global Forum of Democracy of the European Council. The head of the Association of Human Rights in Central Asia, Nadejda Atayeva, received the award in Mr. Bekjan’s stead. Mr. Bekjan has been imprisoned for 15 years in a prison in Zarafshan City in Navoi Region. He is serving time for crimes he did not commit and no attempts undertaken by international organizations to release him yielded results. On the contrary, Mr. Bekjan’s prison term was extended in 2011; apparently he and his family have lost any hope to see him free again. The editor in chief of the Erk newspaper, Muhammad Bekjanov (also known as Bekjan), was arrested 1999 based on charges of involvement in the bombing, which shook Tashkent on 16 Feb 1999. Mr. Bekjanov refuted any and all allegations. He was subjected to inhumane torture during investigation; a written statement about tortures was secretly taken out of the courtroom during his trial. It was the first case when tortures in prison have been widely known among the Uzbek public. 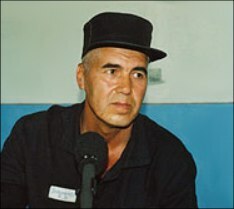 In August 1999, court sentenced Mr. Bekjanov to 15 years of imprisonment, having found him guilty of attempting on the president’s life; infringing on the constitutional order; organizing banned social unions and religious organizations; illegally crossing borders to leave and enter Uzbekistan; possession, destruction or concealment of documents and stamps, forging documents and stamps; and organizing a criminal community. In 2003, Mr. Bekjanov’s term was shortened as part of an amnesty by 3 years and 8 months; he was to be released in February 2012. However, in December 2011, a criminal case was trumped up based on Article 221 (disobedience to lawful demands of penitentiary officials) and Muhammad Bekjan was sentenced to another five years of imprisonment. “I am especially proud for Muhammad Bekjan,” Ms. Atayeva said during the awarding ceremony. “He deserves acknowledgment and respect of the international community. In 1990, Mr. Bekjan was [hired as] the editor in chief of the Erk newspaper, an arm of the first opposition political party in Uzbekistan, the Erk Party. The publication, immediately after its launch, raised such issues discussions of which are still prohibited in Uzbekistan. The issues in question are the privatization of lands, de-monopolization of the economy, uprooting forced labor, gender issues, and ecological catastrophe in the Aral Sea. Ms. Atayeva maintains that Mr. Bekjan was convicted twice on trumped up charges and was repeatedly subjected to torture. He has been held in tortuous conditions in prison. Mr. Bekjan has been suffering from an aggravated form of tuberculosis for many years, but he receives virtually no medical attention; the treatment the journalist receives in prison failed to improve his health. Mr. Bekjan’s condition is further complicated and aggravated by his blood relations: he is the brother of Muhammad Salih, the leader of the Popular Movement of Uzbekistan and an adamant opponent of the Islam Karimov regime. Mr. Salih has repeatedly stated that no repressions of his brothers would be able to force him to step down his political activities. Mr. Salih is currently based in Turkey. Mr. Bekjan’s spouse, Nina Bekjanova, visited him for the last time in March 2013. He told his wife that perhaps he hadn’t much longer to live. “His condition is very dire; he has hernia and maybe tuberculosis worsened. I believe that he must be immediately examined by doctors and be put to the prison hospital. He did not complain about his health until then [presumably her visit in March]. But now he says ‘Not much longer left to persevere.’” Ms. Bekjanova then said she would stop asking for help relatives, the international community, journalists, but would only appeal local authorities. Khayrullo Khamidov, a sports commentator, a journalist of the Champion newspaper and a radio host, remains imprisoned like journalists of the Irmoq magazine on religious issues, Ravshanbek Vafoyev, Botirbek Yoshquziyev, Bakhrom Ibragimov and Davron Kabilov. Many journalists had to emigrate from Uzbekistan in the face of criminal persecutions. Arresting journalists based on sloppy and false accusations is becoming a norm; everyone remembers a recent administrative arrest of the journalist Sergey Naumov for 12 days. “I am certain that this prestigious award for Muhammad Bekjan will receive feedback among all people with good will and will reset in motion the fight for the release of him and other imprisoned journalists,” Ms. Atayeva told the awarding ceremony. The ceremony participants will sign a Freedom banner, and these autographs along with pictures of the award will be sent to Mr. Bekjan directly to the prison. The embassies of the EU, the USA and Canada [presumably in Uzbekistan] will be notified of the award and respective diplomats will be requested to visit Mr. Bekjan in prison to show recognition and solidarity.